It’s policing for profit taken to the next (entirely predictable) level. 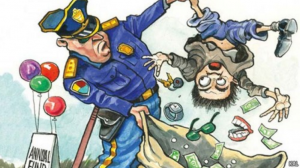 Most states already have “just take it” laws on the books that empower cops to simply seize cash and other property prior to any judicial proceeding – and to keep it, even if there never is a judicial proceeding. The mere fact that you have “excessive” cash on your person is sufficient legal justification in many states to result in its forfeiture – until you prove to their satisfaction it wasn’t “drug” money. It is not their burden to establish… anything. We also have the equally egregious precedent of for-profit enforcement of traffic laws – coincident with the suspension (or at least, the watering down) of any semblance of procedural innocent-until-proved guilty. 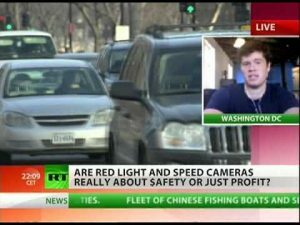 Cities and counties contract with a private company (the notorious Redflex being the chief profiteer) to install automated red light and speed cameras that chuck tickets to offenders automatically, via the mail – with the offender presumed guilty until he proves himself innocent. The ticket is sent to the registered owner of the vehicle – who is not necessarily the person who was driving when the camera snapped the photo of the car’s plates and chucked a ticket to the owner. But the owner must prove it wasn’t him – as opposed to the former necessity of the state/county having to prove it was. So it’s not surprising that states have decided to begin charging people for charging them – that is, accusing them of something. There’s even more potential profit in this since a cop can arrest anyone at any time – just about. 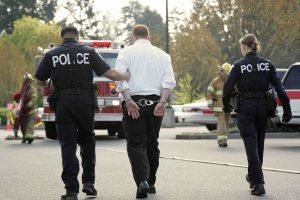 The evidentiary bar has been set extremely low – and whole categories of “crime” have been confected or defined so loosely (e.g., “disorderly conduct,” “interfering” with a law enforcer) as to make an arrest almost a matter of whim. Now add a profit motive to the mix. In economic terms, hanging a dollar sign on every citizen within handcuffing range of a cop is an incentive to handcuff as many citizens as possible. They are, after all, paying customers. Can arrest quotas be far behind? Remember, many state/county cops already have ticket quotas, precisely because of the profit motive. And note that, in some states, even if you successfully fight a traffic ticket, you are still hit with a “processing” fee which you must pay – or else. So it’s no surprise that Colorado doesn’t give money (fines and restitution levied) back to people whose convictions have been overturned. Soon, the Unelected Nine (the Supreme Court) will weigh in on the “constitutionality” of this business. A case headed their way involves a man named Corey Statham, who was arrested in Ramsey County, MN and charged with “disorderly conduct.” He was taken to the clink but released after the charges against him were dropped. His money, however, was not released. He was charged a $25 “booking fee” and other assorted “processing” fees by his gaolers. He is contesting this theft under color of law on the basis that he wasn’t convicted of any crime, hence why should he be punished? The Unelected Nine are not likely to be sympathetic, having previously legitimated assault and battery upon the Fourth and Fifth as well as other amendments. For example, the ex-constitutional requirement that the accused be presumed innocent until proved guilty (in a court of law) has been gotten rid of by declaring things like automated red light/speeding tickets to be mere administrative affairs. Since there’s no prospect of jail time, you (the accused) lose the right to your day in court, including your ex-right to confront your accuser. 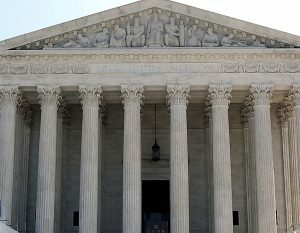 Instead, you may be allowed to file some kind of written appeal, which may or may not be read by anyone – who may or may not be interested in anything you have to say. And – naturlich – you must pay first and regardless. Red Queen style. Maybe they’ll give you your money back. Probably not. It’s dirty pool, old man. And the game is getting more serious. But there is an upside. The fools have showed us their hand. It is clear now to all but the terminally stupid what’s up – and why. We see behind the curtain and know what the man is up to. Or the “safety” of the cops, either.